Looking for the ultimate guide to Laos' Kuang Si falls? From what to do, where to stay, how to get there, when to visit, and our top tips for enjoying the best the waterfall has to offer, this ultimate guide absolutely has you covered! There are two types of tourist attractions in this world; the ones that have enjoyed serious overhyping and leave you feeling a little... underwhelmed, when you finally see them (looking at you, Athens), and the ones that no amount of hype could do justice, so strikingly beautiful are they. The Kuang Si waterfall (also spelled Kuang Xi or Tat Kuang Si) in Northern Laos falls firmly into the latter. In fact, this large cascade of pale turquoise blue water that tumbles from the thick jungle above into perfectly sculpted limestone tiered pools below might just be the ultimate highlight of any trip to Laos. We knew we had to go to Kuang Si after spotting a photo of its milky blue water on instagram a few months earlier. As the day arrived for us to finally make the trip there, we fervently hoped that the falls would resemble, even a little, the stunning photos we'd seen. Thankfully, we can confirm that turquoise, azure, whatever you want to call it: Kuang Si's pools are basically like swimming in the sky on a warm summer's day. There's a reason that Kuang Si is ranked as one of the best things to do in Luang Prabang. Adding the falls to your Laos itinerary is one of the greatest travel decisions you'll make (we've never encountered another traveller who has regretted it! ), while this ultimate guide will make the planning all the easier. 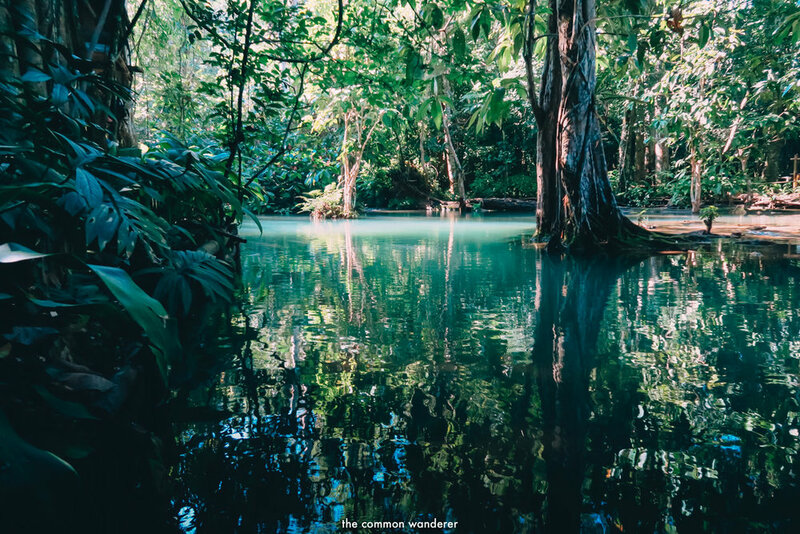 The best part about the Kuang Si falls is that in addition to being mind-blowingly beautiful, you can also take a dip in those same tiered pools of turqouise blue water. There are a few pools you can swim in at the main area, as well as at the very top (more on that below), but please be a respectful traveller and take note of the signs saying no swimming in certain areas, as some pools are considered sacred by the local population. The same also goes for the so-called 'Kuang Si waterfall secret pool' that's gained cult popularity online. It's marked by numerous do not enter signs both for your safety, and because if a local specifically asks you not to go somewhere, you probably should listen. The pools near the picnic area have changing rooms (make sure you change into appropriate clothing again post-swim, Lao culture is quite conservative! ), and they also have rope swings and a tree you can jump into the pools from. For the most part, visitors to the falls will congregate around the lower pools and picnic area, venturing perhaps as far as the small wooden bridge that offers stunning and unobstructed views of the main waterfall. But by only going this far, they're definitely missing out on what is probably the most epic view of all: the one from the very top. Search to the left of the wooden footbridge and you'll eventually uncover the almost-hidden steps that lead the way to the top. The hike up will take about 15 minutes and isn't too taxing in terms of steepness, however you'll may find the terrain a little tricky. The steps are without railings, and there's water flowing over it in some parts. The tricky hike up is totally worth the views though; on a clear day you'll find yourself looking right out over the breathtaking Lao countryside. And while the noisy crowds clamour around the big falls below, up here there's nothing except the peaceful trickle of flowing water, a couple of small pools to take a cool dip in (season dependent), beautiful forest with twisting tree roots, and a small picnic area to relax at. Once you're done taking in the views, head for the path to the right to make your way back down again - it's smooth, steep, and step-free, which makes climbing down easier (and climbing up near-impossible!). There is a restaurant nearby, but we recommend packing your own lunch (or picking some up at the market outside) and enjoying your own picnic with a (waterfall) view. There are plenty of picnic tables on the lower levels, that are perfect for a mid-afternoon snack stop and relax before continuing your explorations. One of the most breathtaking views of the falls is from the wooden footbridge that stretches out above the lower pools. Here, Kuang Si takes center-stage, a powerful 50m drop of cascading blue water tumbling over the yellow stones. It's also as close as you can get to the falls, and gives everyone the opportunity to snap an instagram-worthy photo without a million people or infrastructure in front of it. As you enter and exit the Kuang Si waterfall, you'll do so via the local market that's sprung up next to the parking area. The delicious smell of BBQ will tempt you to all sorts of tasty treats, while a cold Beer Lao or Namkhong can always be found. You'll also find lots of local souvenir and handicraft shops here, along with a couple of small bars. Before you get to the cascading pools of the waterfall, you'll have an unexpected stroll through the Tat Kuang Si Bear Rescue Centre. At first glance, this rescue centre slightly resembles a rudimentary zoo more than a sanctuary - which is actually what we first mistook it for. But fret not if you're worried about involuntarily supporting animal tourism (as we were), the centre is operated by Free the Bears, and is home to more than 20 Asiatic Black Bears that have been rescued from an array of dire circumstances. From living their entire lives in cages suspended above the Mekong to being sent to Bear Bile farms to have their bile harvested (which is used in medicine), all of these bears have been lucky to escape their fates, and are now living happy, healthy, well-adapted lives right here at Kuang Si. The bear enclosures are large, with hammocks, pools, and basic play areas to keep them entertained. The centre doesn't receive any of the admission fee for Kuang Si, and relies instead on donations or t-shirt sales sold at the falls, if you'd like to support the cause. Your swimming gear! There are changing rooms near the picnic grounds. Don't forget your towel, a dry bag, and a change of dry clothes too. Proper shoes - the hike to the top of the falls can be steep and extremely muddy. Flip flops won't do the trick here! Snacks & drinking water (in your reusable water bottle!) - the food at the Kuang Si restaurant can be expensive (and by all reports, a little average). Make sure to pack some lunch and lots of water, especially if you're there for the day. Sunscreen! 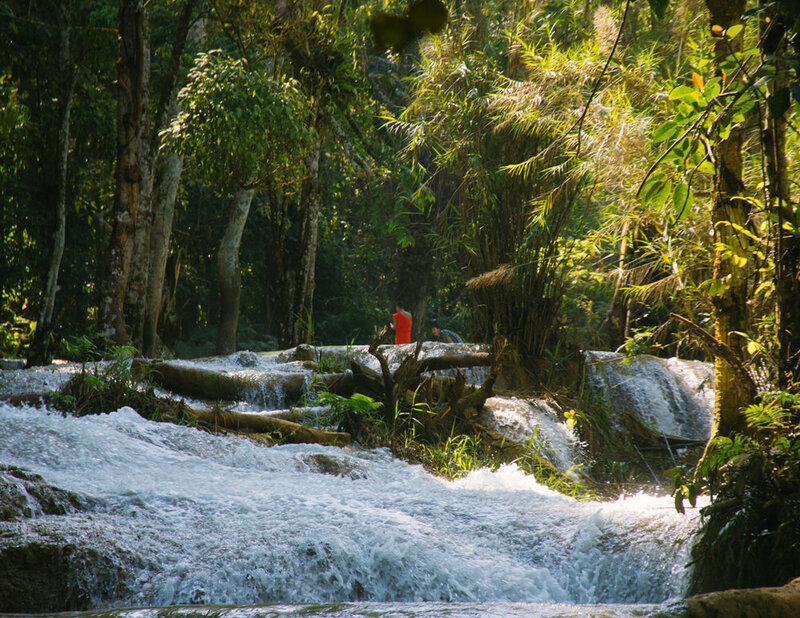 While the falls are in lush Lao forest, you won't escape the sun's rays here. The best time to visit Kuang Si falls is from December through to April/May, when the monsoon season has finished and the cascading pools have settled again. During these months, the water flows over the limestone rocks more slowly, collecting traces of limestone as it goes and giving it that beautiful turquoise colour you see in the photos. Obviously, this is also the peak tourist season, so try to get there early on a weekday to avoid the crowds. Outside of the peak times, like during Laos’ monsoon season from July to October, heavy rains transform the falls from the calm, picturesque scene we all recognise from the photos to thundering rapids that are a muddy coffee colour instead. Swimming is impossible, hiking is dangerous, and the only real positive is the lack of crowds! As with most popular tourist spots, this is a place you'll want to come early to beat the busloads of tourists that will arrive throughout the day! We arrived around 10am and had the falls almost to ourselves for quite some time. By 1:00pm, the crowds had well and truly arrived and the place was bustling beyond comprehension. Want to have a refreshing dip without being crammed in like sardines, take epic shots without anyone in, or just enjoy the serenity of the area? Get there as early as possible, and ideally, on a weekday. Shared tuk tuks (actually called Songtaew here in Laos) are basically just pick up trucks that have been customised with two rows of wooden benches facing each other. They generally fit 6-7 people, and are by far the most common way to get to the falls. It's super easy to find a tuk tuk in town, though you'll need to haggle a little to find someone to take you for a decent fee. Prices should start around 200,000kip, which works out to about 50,000kip (6USD) per person once 4-5 people have jumped aboard. If you're keen to take a shared tuk tuk, we'd recommend pre-organising your group ahead of time, either by getting all your friends to come along or asking around at your hostel. If you don't already have a group pre-arranged but still want to save some cash, drivers will wait until they have a group of people ready to go - which means you'll be stuck waiting for fellow passengers for a while. Most of the time, your fare will include a return trip and a few hours at the falls together, but always double check this before leaving. The group will also need to agree on a set leaving time so that no one gets left behind! If you're keen to get moving or just want a little more control over your timings for the day, you can also book a private songtaew for the day. A private tuk tuk will cost you about 180,000 - 200,000kip or US$22-25 for the day, and the driver will wait for you at the falls to take you back into town. This is great if you're keen to run on your own schedule, take your time, or get there before the crowds for photography etc. When haggling with your driver on tuk tuk prices, always remember that fuel in Laos is actually really expensive, going to the falls is a proper day trip (so your driver probably can't take another fare today), and there are fees involved for driving. Always haggle hard, but fair! Also, be aware that some tuk tuk drivers can be a little unpleasantly pushy, particularly the ones hanging around the key tourist areas in Luang Prabang, so check with your hostel or hotel if they have the contact details for any reputable drivers they normally work with. Public minivans run shuttle services between Luang Prabang and Kuang Si falls each day, and at around 60,000kip they can often be the most economical way to get to the falls. The disadvantages are that the departure and return times are set, so you'll only get a few hours at the falls - and they can often be slow to get out there as the shuttle stops at each passenger's individual hotel to collect them. Hiring a private car or mini van is the most comfortable option if you've already got a group of friends ready for a day of adventures. With this option, you'll generally arrive in the comfort of your air-conditioned van with a private driver, and you'll enjoy more flexibility in deciding what time you'd like to leave the falls again. Private cars / mini-vans generally start at 250,000kip / USD $30, which makes them really economical if you've got a mid-sized group ready to go. This is probably one for the travellers in search of a true adventure, as the road to the falls is long, bumpy, potholed, and extremely dusty. It's also mostly uphill, so you'll definitely have earned your refreshing swim when you finally make it there! You can hire bikes around town pretty cheaply for USD$2-3 for the day. If you're not so sure on doing the full roundtrip by bike, you could also cycle there then hire a tuk tuk back at the falls (or vice versa). If you're keen to do things independently, you can rent a motorbike or scooter in town to transport yourself there instead. Generally this should cost you around USD $20/day + petrol and parking at the Kuang Si Falls (2,000kip). Always make sure that you hire from a reputable agency, as there are some known motorbike theft scams where dodgy agencies 'steal' your bike back after you've hired from them before charging you for the cost of replacing it. Pay a little more for trustworthy service and enjoy peace of mind! It's here that we feel we should probably jump in and say that as always, you'll need to calculate the risks involved with hiring a motorbike in this part of the world, and whether your travel insurance adequately covers motorbike accidents (check out our guide to what you need to know about travel insurance here). The roads around Luang Prabang aren't overly well maintained, some of the bridges are questionable, and the driving skills aren't always what a foreigner would be used to back home. Unfortunately tourist motorbike accidents can, and do, often occur here, so you really need to make sure you keep your wits about you and avoid being reckless. Especially considering the nearest 'foreign standard' medical care is an international flight away in Bangkok! Wear proper helmets, clothes and footwear, don't leave your belongings on the bike when you're not there, and always lock up your bike properly. This is perhaps the most novel way of getting from Luang Prabang to Kuang Si falls - a slow boat ride down the Mekong! The one-hour boat ride will take you downriver, winding through wild and rugged mountains, jungles and glimpses of peaceful and authentic local life, past areas that are hardly accessible by car. The boat will go as close as it can to the falls before a pickup takes you the rest of the journey. There are currently two main operators that run this option, the Banana Boat Temples, Bears, and Waterfalls day trip which also takes in the 200 year old Long Khoune Temple and its medi­tation cave, and Tiger Trail's Bike, Swim, and Longtail Boat ride tour, which (you guessed it!) cycles to the falls and cruises back again during the magic of golden hour (that late afternoon glow that makes everything 1000x more picturesque). The Pak Ou Caves + Kuang Si Falls day tour takes you to the super popular Buddha-filled Pak Ou Caves, a rural village where you'll get a feel for local life and see how villagers make rice wine, before venturing on to the falls for the afternoon. This private guided tour of Kuang Si starts with an optional visit to the sunrise alms giving ceremony, a wander through the stalls at the lively Phosi Market, and a visit to some traditional Hmong villages before a hike through the rainforest to the waterfall. This Luang Prabang highlights tour is the ideal day trip for anyone short on time but looking to maximise their sightseeing potential in Luang Prabang! You'll visit the former Royal Palace, the Vat Xieng Thong monastery, visit a village famed for its weaving techniques and beautiful textiles, a visit to Kuang Si falls, before heading back to Luang Prabang via a stop at Ban Na Oun to learn about traditional Lao handicrafts. The day ends with epic views of the city from Mount Phousi - a must-do on any Luang Prabang itinerary. There's (thankfully) no accommodation near Kuang Si falls, which means that most people opt to stay in Luang Prabang and take a day trip from there to the falls. There's no shortage of accommodation options in this beautiful UNESCO-protected city; use the options below to find the one best suited to you. Luang Prabang is firmly planted on the so-called ' Banana Pancake trail', aka the backpacker trail in Laos, which means plenty of cheap and cheerful accommodation options for the budget traveller. We stayed at the Lakanthong 2 Friendly Guesthouse (formerly Central Backpackers Hostel) and found it to be comfortable, quiet, and cheap enough for our small budget! Check Hostelworld for the best deals on hostel rooms now. The charm of Luang Prabang definitely doesn't end when you head back to your hotel. There are plenty of options here that showcase the city's traditional heritage along with its French colonial past. Think airy villas, intricately carved wooden details, and gilded rooftops for days. When we travelled through Luang Prabang a few years ago, very much on a backpacking budget, airbnb both hadn't really taken off there yet, and the few that had were well out of our price range. Today, lots of options can be found to suit all styles, from luxury 8-room villas overlooking the Mekong right through to private rooms in a Lao house. Sign up with a new account, and use our special discount code to get up to £30/$40 off your first booking! LIKE IT? PIN & SHARE IT! Some of the above links are affiliate links. If you choose to purchase using the above buttons we receive a small commission at no extra cost to you. Please know that by using these affiliate links, you're directly supporting The Common Wanderer to stay wandering, and you're officially a legend.